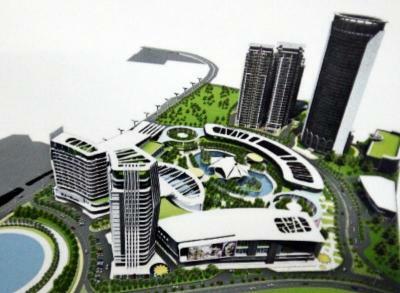 An artist’s impression of Naim’s Batu Lintang mixed development project with gross development value of RM2bil. KUCHING: Naim Holdings Bhd will develop the site of the old Bintulu airport into an integrated upmarket commercial and residential project. The new city centre for the booming industrial town will comprise condominiums, street mall, international class hotel, shopping complex and other related facilities. Corporate services senior director Ricky Kho said the project on about 12ha would have a gross development value (GDV) of RM2bil. “It will be implemented in two phases, with phase one targeted for launch by year-end,” he told StarBiz. Kho said the proposed street mall would feature commercial shophouses and small home offices while the three-star hotel would have about 200 rooms. The condominium blocks would house some 600 units for sale to both local and foreign buyers. “Phase one development is expected to take five years. Phase two will involve construction of the shopping complex,” he added. Naim, Sarawak's biggest property developer, is expected to own and operate the shopping complex as a long-term investment. Kho said there was a strong demand for quality accommodation like hotel, condominium and serviced apartment in Bintulu with the big influx of expatriates involved in the development of energy-intensive industries in Samalaju Industrial Park. Samalaju is one of the five growth nodes of Sarawak Corridor of Renewable Energy (SCORE) and it will become the state's new heavy-industry centre. Bintulu is now undergoing its third industrial boom. Besides the setting up of heavy industries like aluminium and manganese ferrosilicon smelters, the city also has two other major projects the Samalaju deepsea port and Petroliam Nasional Bhd's Bintulu liquified natural gas Train 9. Naim will make its Bintulu integrated mixed development a major retail centre, leveraging on the growth of SCORE. Meanwhile, Kho said Naim was expected to commence construction work of its proposed RM1.5bil mixed development in Batu Lintang here in the next few months as planning approval had been obtained. The joint-venture project will involve the development of a 27-storey apartment, 18-storey condominium, 36-storey office tower, shopping mall, 17,000-sq-ft showroom, multi-storey car parks and water theme park. The prime land, which was previously occupied by government quarters, has been cleared. He said phase one would involve some apartment and condominium units. Naim's joint-venture partners in the project are charitable trusts, Lembaga Amanah Kebajikan Masjid Negeri Sarawak and Tabung Baitulmal Sarawak. Kho said Naim had chalked up strong sales of properties this year, boosted by the high take-up rates of newly launched schemes in existing townships in Miri and Kota Samarahan. “We have registered sales of about RM125mil as at May 31,” he added. Last year's sales was RM184mil an increase of RM42mil over 2010. He said the top-selling properties were single-storey semi-detached and terraced houses in Miri's Permyjaya township (Naim's flagship development) and terraced units in Desa Ilmu in Kota Samarahan. Naim is also recording good sales for its walk-up apartments launched recently in up-market Riveria satellite township near here. The company has set up an office in Kota Kinabalu to prepare for its property development expansion in Sabah. Naim, which has a land bank of about 1,050ha in Kuching, Miri and Bintulu, is on the lookout to acquire more land.